What happens when a tough-as-nails Russian outdoor-enthusiast puts their mind to manufacturing mobile phones? Something resilient and daring comes out of it. In an initial move to break into the rugged phone market, Russian-based adventure-oriented company Aermoo launched its first mobile creation the Aermoo M1, an Android smartphone covered in a tough aluminum alloy. But a new contender is now in sight: introducing the Aermoo M2, an Android smartphone designed in Germany that will soon be available along with some unique features and hardware the world has yet to see. The Aermoo M2 is built for those who love the outdoors, from moderate to extreme sport types, and is well-equipped for the task thanks to its various rugged features, the first being its resistance to water and dust: the Aermoo M2 goes beyond the IP68 rating and offers the highest protection rating of the Ingress Protection (IP) rating system, being IP69K. This means it is resistant to penetration of high-pressure, high-temperature water and dust. It will stay fully functioning immersed in up to 1.5 m of water for 24 hours. Whether you’re crossing mountains, rivers or deserts, the M2 will be your loyal companion in the great outdoors. The solid metal frame will protect the M2 from drops, while its resilient plastic cover resists scratches. Thanks to its makeup of thermoplastic polyurethanes (TPU) elastomer and polycarbonate (PC) the Aermoo M2 excels in shock absorption. What's more, it is insoluble and resistant to oil, water, and mold. Its material also has a good level of elasticity that allows it to remain in up to a -35℃ outdoor environment. The Aermoo M2 is the very first rugged phone to sport four cameras: you'll find two 16 MP + 13 MP dual lenses on both the back and front of the device. The sensor works with PDAF tech to produce fast-action pictures that especially clear and vivid in just a second. 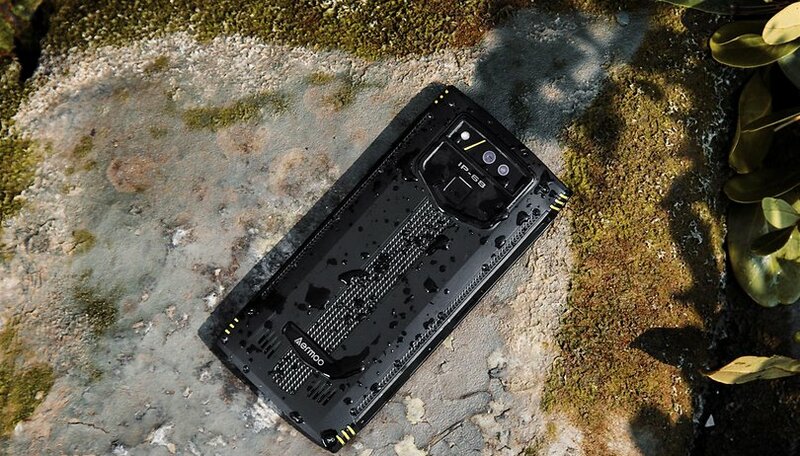 What's more, its water resistance allows the M2 to shoot under water. PureView Carl Zeiss® can be found on the phone. Corning Gorilla Glass covers the Aermoo M2's screen making it durable and scratch-resistant. It is able to withstand intense pressure, repeated touch and extreme conditions. The M2 is the world’s first rugged smartphone with a 5.7’’ HD+ full-screen display and an 18:9 aspect ratio. IPS technology greatly enhances the dynamic display effect. Furthermore, wide viewing angle and accurate color reproduction makes every detail on the display show clearly outdoors. The Aermoo contains a powerful octa-core Helio P23 CPU with 6 GB of RAM that allows it to deliver a strong multitasking performance. Users are offered a flawless operating speed and smooth user experience. The Helio P23 CPU builds on a 16nm FinFET+ processer and incorporates eight Cortex-A53 cores clocked at up to 2.5GHz. The smartphone has low energy consumption. The Aermoo M2 is powered by LPDDR4x memory technology, which is advantageous for some resource-hungry tasks like gaming. Its 128 GB of internal storage permits you to save every precious app, picture, and video right on your phone without needing the Cloud (or internet). Plus, inadequate storage space will never be a worry also because of its expandable 256 GB memory thanks to the SD card slot. Taking videos of the spectacular scenery can be done stress-free. When in the great outdoors, there are certain tools that may come in handy, and the Aermoo M2 has a weatlh of them: it has multiple navigation tools customized especially for explorers, like SOS, GPS, Compass, Geomagnetism and Gyroscope. The upcoming rugged phone is not yet available, but can already be pre-booked (reserved) from the Aermoo website. I calculated: starting from 5.7", 276 dpi(!) and 18:9 result 1.407x704 pixels !